Yesterday, we gave you Boston, Baltimore, LA, and Chicago—all distinct accents with notable hometown heroes (please continue to vote until 2 p.m.). Today we have even more guttural garbage to throw your way, even if you weren't looking for it. These four accents may not be as stereotyped and diligently cataloged as yesterday's but they've all got their own hideous charm. Let's jump right in, shall we? 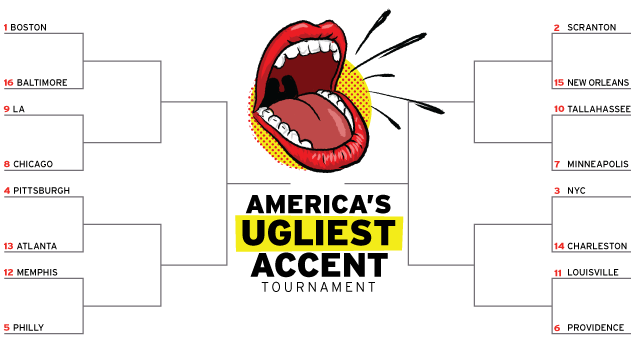 Our round of 16 continues with two ugly brawls: Scranton (2) vs. New Orleans (15) and Tallahassee (10) vs. Minneapolis (7). A vocal range of the United States uglier than my boyfriend. Maybe you've seen an episode of The Office and so now you know where Scranton, Pennsylvania is. Maybe you're familiar with Gawker hero Raymond Lyman. The Scranton accent, formed in the lung-blackening coal mines of northeastern Pennsylvania, shares the dirty unfortunate slurring of the Philadelphia accent but with the added bonus of the Midwestern wide mouth. Somewhere in between Pittsburgh and New York City lies an untapped fount of perfect-ugly accents. Example sentence: "You took arh rights away with this ridikulous four minutz, fightin with people, not given us anssers, and tellin people they're outta order. Ridikalous." Example sentence: "Dawlin', am headin' down to the coardner to pick up a dozen ersters." Tallahassee in this case stands in for all of panhandle Florida—home to a true, and truly ugly, Southern American English accent, and has sister dialects in the Florida cracker accent (also known, for obvious reasons, as Florida mushmouth) and African American Vernacular English, and both are as Southern with a slackjaw as a Texan's. This accent is largely what people who are imitating residents from the South would default to. Example sentence: "Y'all wanna trah this pin to wrahte to yer mama?" The Minneapolis accent isn't nearly as strong compared to the rest of rural or suburban Minnesota (big cities are usually the first to lose their distinct regional sounds), but Minneapolis retains more than enough of those Midwestern vowels to make your ears bleed. Think Fargo (they'll tell you it's exaggerated; don't believe them). Example sentence: "Git da beg of groshrees out of my car."